One of the things that I hope my forthcoming book on the battle of the Crater and historical memory does is find a place in a growing literature that challenges the reunion and reconciliation school of Civil War Memory. It’s beautifully expressed by David Blight in Race and Reunion: The Civil War in American Memory and suggests that white northerners and southerners eventually brushed aside a memory of emancipation for one that embraced a shared history as well as a set of values that allowed for a swift and relatively painless sectional reconciliation. There is a certain amount of truth to this story. The story of the Crater, however, simply does not follow this broad narrative outline. The veterans of the Virginia brigade engaged in bitter feuds relating to the battle and the role of William Mahone during the few short years of Readjuster control. Mahone learned that there were limits to which he could utilize his military career to advance a political agenda that advanced the cause of the state’s black population. And while numerous meetings between former enemies took place on the battlefield, white southerners never adopted a language of reconciliation when commemorating the battle. This was a decisive Confederate victory that highlighted the fighting prowess and character of their own. The presence of a black division was simply too much for many of the veterans to forget even at the beginning of the twentieth century. This monument is not alone a memorial for the dead but an incentive to future generations to patriotism and high ideals. The period of the civil war had its shadows, out of which came the pure white figure of patriotism, of loyal service of generous sacrifice, of ministering angels, of tender compassion, and heroic champions of freedom and union. So will it be with the clouds of today. There has been no year since your service in the field when the battle has not been on, not of shot and shell, but of the clashing activities of peace—the struggle of clashing interests, out of the very selfishness of which, however, springs that human endeavor which in the long run works the ultimate steady, average betterment of all. Glorious as were Gettysburg and Appomattox the great glory was that we had reached that degree of widening of our thoughts; that point in moral conviction and devotion in which those great victories and devotion were only the incident of the greater moral victories of freedom over slavery, of right over wrong—victories just as much for our Southern brethren as for ourselves. Let the young men of today fight the good fight for righteousness, which is now calling them to battle, as you in your day fought the good fight for union and freedom. That second paragraph is incredibly rich. In this case the preservation of the Union sits comfortably within the larger accomplishment of ending slavery. If there is a hint of reunion it is couched in the observation that moral victory of emancipation was also a victory for the South and, by extension, the entire country. That’s just one example. Luckily, the Massachusetts Historical Society has everything I need. 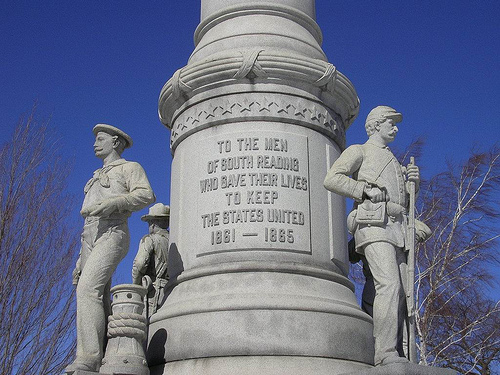 Suggestions for further reading on Massachusetts veterans and monuments are greatly appreciated. I highly recommend two new books on Civil War veterans, both of which are published by the University of North Carolina Press. The first is Barbara Gannon’s, The Won Cause: Black and White Comradeship in the Grand Army of the Republic and Sing Not War: The Lives of Union and Confederate Veterans in Gilded Age America by James Marten. What must be the largest CW memorial in Mass is Harvard’s Memorial Hall. The memorial portion dedicated to Harvard men who died “In the War to Preserve The Union” has every name and date of death of everyone who ever attended Harvard and who died in the war. No Confederates were allowed even though there were many who fought for the CSA, States Rights Gist being among them. for obvious reasons the Revolutionary period has dominated the local history. the major CW memorials are the Shaw , Memorial Hall, the Library lions and the Farragut statue on Broadway in Southie. in the Bay State the Minuteman is the big hero. the best excuse to see Memorial Hall is to go to a concert at Sanders Theater which is in the hall. Classic, acoustic folk, bluegrass whatever. I’ve been to bunches ofshows. the BPL is an artwork in itself. the interior is amazing,. and it’s really the State Library as it’s State funded and any Bay State resident can get a card for it so even if you’ve settled in a suburb you can use it. It’ll be interesting to see what you find. I was going to write that the reconciliation hypothesis looks pretty strong based on some of my research. I’m thinking of one veteran-orator whose speech at the regiment’s first reunion in 1877 featured slavery sounded a lot like the speech you cited, but whose 1898 regimental monument dedication speech was 100% reconciliation. So, I inferred a trend toward reconciliation over time. But, I wonder now if the difference in the speeches was more due to the speeches’ settings rather than differences in attitudes. Anyway, I guess what I want to say is that if you do run across anti-reconciliationist sentiments, see if they made their way to battlefield commemorations or stayed at home. Also, I hope to take more of a look at the intersection of Civil War memory in its adolescent stages and party politics of the mid-to-late 1860s, when–at least here in Pennsylvania–the Democratic party launched a full-scale counterattack on the movement toward racial equality as the two parties jockeyed to present their platforms as compatible with the war’s purpose. Thanks for the comment. You make a number of interesting points. I agree that setting mattered. The speeches of members of the 57th Massachusetts at the Crater in the 1880s were full of reunion sentiment, but what did they say when they were on their own turf? I spent yesterday reading through dedication speeches and every one at some point focused on the importance of emancipation and the end of slavery. One speech given at the dedication of the Melvin monument in Concord went after those who reached out to their former enemies and ignored the war’s accomplishments. Clearly, Union is the overarching theme in this story and Gallagher is right that we need to give it more attention. I am finding that the preservation of the Union was interwoven with the assumption that the Union had come closer to perfection because of slavery’s eradication. Obviously, I am in the early stages of my research and I want the evidence to push me. Today it’s back to Concord to look at memoirs from the local G.A.R. chapter. Thanks so much for the shout out! This sentiment is everywhere in separates about the CW in the decades after the war. When I began my research I though I had found memory outliers, no. Only after I read it EVERYWHERE even in Southern GAR addresses, did I understand that this was a common interpretation of the war, The Won Cause. One thing that suggests itself – given the 1910 date, is this – “the good fight for righteousness, which is now calling them to battle,” – potentially a reference to the temperance movement? Shame on harvard for not icluding the CSA alumni, they do however list the names of students who fought for the nazis. What the Harvard case demonstrates — if you read the article carefully — is that memorials usually tell us far more about the views and attitudes of those who put them up, than they do about the historical events they commemorate. (Kevin has pounded on this subject many times.) The South is dotted with Confederate monuments that are equally cringe-worthy to modern sensibilities. Needless to say, any modern attempt to change or remove those monuments generate instant and shrill complaints of “political correctness” and “cultural genocide” from various heritage groups. Given that the memorial to Harvard’s Civil War dead was put up in 1870, it seems to me that the most appropriate course would be to hold those people directly accountable. I suggest starting a petition drive to have every member of the Harvard Board of Regents who voted to approve that memorial, removed from the board immediately. Memorial Hall was “built” by Harvard grads who were CW vets like Stephen Minot Weld. and others.